Most of us associate hot tubs with relaxation and a luxurious soak in warm water. The great news is hot tubs and spas can improve our physical and mental well-being in many different ways. Here’s Kiwi Spas’ top 10 health benefits from owning a hot tub or swim spa. If you have any pre-existing medical conditions, we strongly advise you to check with your doctor on whether using a hot tub or swim spa will be beneficial to you. Let’s start with the obvious one! 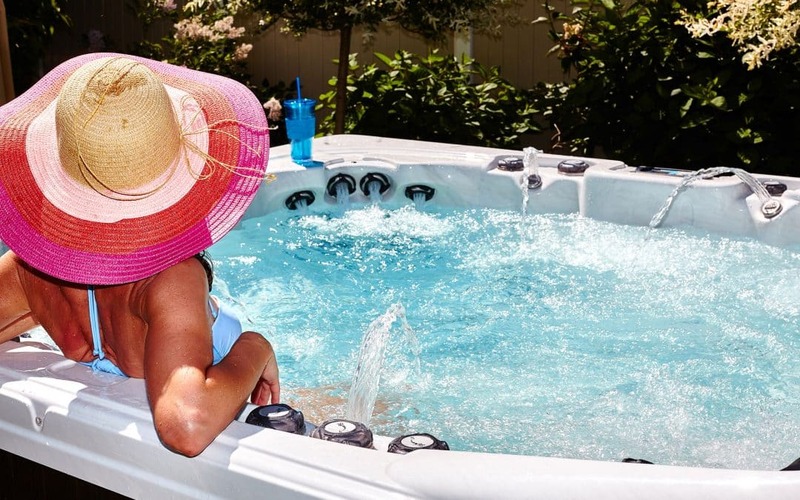 Relaxing in the warm, calming waters of a hot tub can greatly reduce your stress levels. Reducing stress will positively improve your mental and physical health and promote a feeling of general well-being. Hot water helps relax your body and the hydrotherapy jets in a hot tub or swim spa provide a gentle massaging effect, controlled by you. Spending time in a hot tub can alleviate aches and pains associated with athletic injuries like muscle pulls or even arthritis. If you’re in pain and it’s not caused by a broken bone, a good soak will help you feel better and take the pressure off your aching body. We’re all familiar with the benefits of taking a warm bath before we go to bed. Imagine how much more relaxing it is to lie back in a spacious hot tub or swim spa and let the gentle jets prepare your body and mind for a good night’s sleep. As you sink your tense body into a hot tub of hot water, the heat raises your body temperature and relaxes your muscles. This makes you tired and relaxed, which can help you sleep better. Please don’t ever try and fall asleep in a spa bath – the possible result will be anything but relaxing. Immersing yourself in water up to your neck can give you an effective cardiac workout. Warm water and the jets in a hot tub or swim spa puts gentle pressure on your body, which makes your heart work harder and helps it stay healthy. Obviously, if you have any kind of heart condition, you should check with your doctor before using a hot tub or swim spa. As well as improving your cardiovascular health, the warm water of a hot tub can lower your blood pressure. Again, do check with your doctor first if you have any known heart conditions or are taking medication for high or low blood pressure. Anecdotal evidence shows that people with diabetes who take regular spa baths can reduce their blood sugar and blood glucose levels. It has also been reported (although not scientifically proven) that taking a spa bath for 30 minutes, six days a week can help you lose up to four pounds in weight a month, without making a single change to your diet or exercise regime. Lying in a hot tub is not a miracle weight loss treatment but, combined with healthy eating and exercise, it will certainly aid your efforts. And, imagine how much a swim spa could boost your get fit efforts – especially if you use it every day to swim as many lengths as you can manage. The heat from the warm water opens your pores and allows the clean waters of a hot tub or swim spa to clean dirt and toxins from your skin. Come out feeling refreshed and cleansed. Warm water dilates your blood vessels and, combined with the relaxing sensation and warmth from the hot water of your hot tub or spa, can get rid of a stubborn headache. When we feel relaxed, we tend to feel happy and hot tubs create a sense of well-being that can really make you feel great. A good soak before an important event can reduce your stress, improve your confidence and help you prepare mentally. Feeling relaxed in both body and mind helps us to create the right mood for romance. The warm waters and pulsating effects of the water jets in a hot tub or spa are a great way to take your mind off day to day worries and focus totally on your partner – especially if they’re enjoying the hot tub with you! 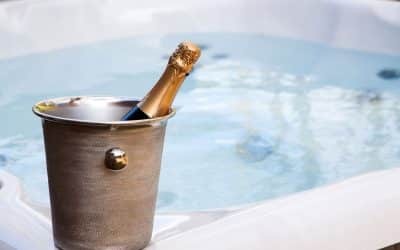 We’ve explained the potential health benefits from a luxurious soak in a hot tub but, as with anything in life, you need to apply a little common sense. Don’t use a hot tub if you’ve been drinking alcohol but do stay hydrated by drinking water before, during and after a long soak. Do check with your doctor before using a hot tub if you have any pre-existing medical conditions or are pregnant. 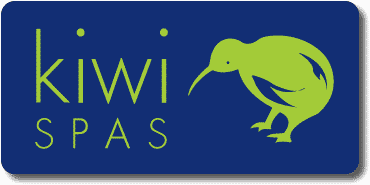 At Kiwi Spas, we’re always happy to help customers choose the perfect swim spa or hot tub to suit their garden, family and budget. Contact us today for free, professional advice you can trust. Enjoying a Winter Hot Tub is the Best! Kiwi Spas launches new website with special offer on 5-person hot tub – just £3,200! 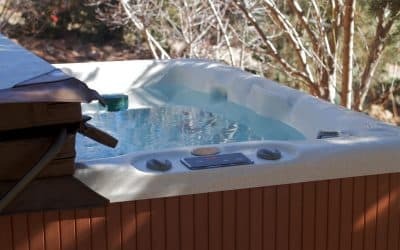 Is my garden suitable for a hot tub or swim spa? Most gardens, even small ones, can usually accommodate a hot tub with ease. Lots of our customers at Kiwi Spas have relatively small gardens and still manage to find the perfect spot for their new hot tub. Got a question. We've got it covered.